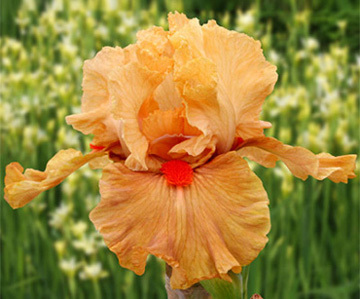 From Mid-America Garden catalog, 2011: I'M ON FIRE (T.Johnson ‘11) IB Midseason 25” (63cm). Put on your sunglasses to protect your eyes from this brilliantly colored jewel. Standards are bright coppery orange with styles a few shades darker. Vibrant rusty orange falls are set afire by screamingly bright orange red beards. Form that is sometimes a bit quirky adds to its allure and distinctiveness. You'll see this one from across the garden. Sdlg. TA113B: Yahtzee X Decadence. $24.00.